Nintendo needs to be a little bit more forthcoming with Wii U details if it wants its investors back. Nintendo revealed the Wii U, the successor to the massively successful Wii, at E3 this week. It delighted the crowds in Los Angeles, but investors were much less impressed and Nintendo's share price dropped to its lowest point in five years. Panoptic Management Consultants analyst Asif Khan believes he knows why this happened, and largely puts it down to uncertainty about the device. "Put very simply," Khan said. "Investors hate uncertainty." He said that Nintendo had not revealed enough information about the Wii U. Investors had no idea what it could cost, when it was coming out, what the specifications would be, who was supplying the components, and even what the features would be. "Given the uncertainty," he added. "I am not surprised shares have sold off." 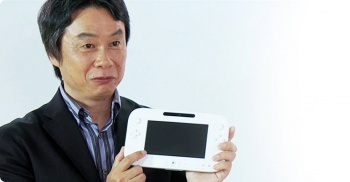 He also felt that the Wii U's unusual controller was proving to be a sticking point for some. Most investors had not had a chance to use it, he noted, and the demos that Nintendo showed off were rather limited. He didn't think that Nintendo had become a bad company to invest in overnight, however, and said that he was advising his clients to seize the opportunity to buy stock while it was relatively cheap. With a year to go before the Wii-U actually comes out, it stands to reason that Nintendo is going to be a little vague about it. It's not hard to see Nintendo bouncing back when the Wii U's launch is a little closer, and it has revealed more of the console's features.